As the world celebrates reggae maestro, Bob Marley’s birthday, Indians too keep him alive in their memories in many ways. Whether it is with the words ‘one love’ or the large marijuana leaves in the background, Bob Marley’s image is abundantly visible in India. 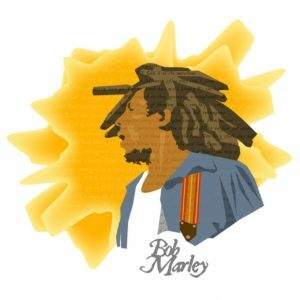 It is not uncommon to find Rastafarian red-gold-green bracelets, posters and t-shirts with Bob Marley’s face at any market across the country. Marley has undeniably left a deep impact on the world for his contribution to music and his larger than life personality is one to rejoice and remember on his birthday today. The roots of the popularisation of reggae music, or the genre itself, has found itself attributable to the works of Marley. With the discovery and subsequent restoration of recordings referred to as ‘the lost masters’ which were found in a hotel basement, the world is hoping to rediscover the beloved musician’s works. Spreading messages of peace and unity, Marley’s music has found resonance among many Indians who have worked to sustain his legacy in various ways. ‘Dreadlocks Story’, a documentary that came out in 2014, had tried exploring the Rastafarian culture and beliefs, which Marley is so famously associated with, examining spiritual links between Jamaican Rastas and Indian Sadhus. “Due to British colonists, Indians and African descendants have met in the plantations and created something absolutely unique and indispensable to express what they had been oppressed by,” states the description on the film’s website. While such historical links between the cultures may still be on their way to being established, the musical connection between the two countries is strong. Whether cafes, themed musical evenings or bands and musicians themselves who take inspiration from Marley, it is not difficult to find spaces where the love is being kept alive. One can head to the Bob Marley café and beach house in Mahabalipuram in the southern Indian state of Tamil Nadu. Another such establishment, the Bob Marley Restaurant in the city known to the world for its monument Taj Mahal, Agra. Hill stations such as Kasol in Himachal Pradesh are particularly prominent in expressing their love for Marley, with posters, graffiti and quotes abundantly visible all across. Tribute nights in cities across the country, such as Pune, Mumbai, Dlehi and Bangalore with venues such as The High Spirits, are common and music lovers get together and celebrate music by Marley, humming to classics such as ‘Get up, Stand Up’ and ‘Redemption Song’. In the serene Syntu Ksiar area close to Jowai in the northeastern state of Meghalaya in India, a second annual Natural Mystic Bob Marley Tribute Concert is taking place today. Reggae Rajahs and Kabir Café are great examples of musicians who have incorporated various elements from different genres to bring together the tastes of music today with traditional Bob Marley style reggae.